Forget for a minute -- if you can -- the incredibly nasty battle for the GOP nomination that's drawn so much attention. You just might have missed what's starting to happen on the other side of the aisle. Hillary Clinton and Bernie Sanders both said they were committed to running positive campaigns. But in the recent debates and especially off the stage among their aides, it's becoming a very different story. And if the new trajectory holds up -- a highly competitive and pitched battle between the two -- the sniping, hits and accusations are likely only to escalate as the primary season wears on. It's not master attacker Donald Trump and the free-for-all on the GOP side, but it's not what the Democratic party had ever imagined. Beneath the talk of common ground, agreement and mutual admiration, there is a latent animosity between the Clinton and Sanders campaigns that now threatens to boil over. In interviews with CNN following Thursday night's faceoff, representatives from both campaigns accused the other side of mudslinging and negative campaigning even as, in the same breath, they continued to tout the Democratic primary as a model of good behavior when compared to that of the Republicans. Sanders' campaign manager Jeff Weaver first insisted that "the Democrats are running a more issue-oriented campaign than the Republicans." Only seconds later, he accused Clinton of "flinging personal mud" at Sanders. "The mudslinging seemed really out of place," Weaver said. "It seemed very much like what you see in a Republican debate." Jennifer Palmieri, Clinton's communications director, struck a similar tone: "Have you seen a Republican debate? It's a very different deal," she said when asked about the tension between the two candidates. But Palmieri then added, "In the last month, Sanders has got increasingly personal and negative. He's had a lot of innuendo about how she took donations [from Wall Street] and how that must mean it's affecting her views -- without any evidence." 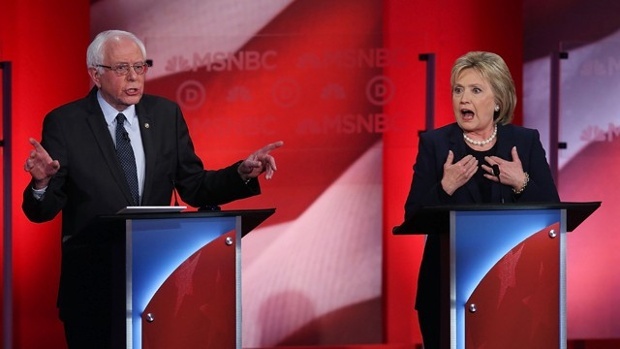 Make no mistake, Clinton and Sanders are on common ground on several issues. At least nine times during Thursday night's showdown, the candidates professed to have the same position on the issues. "I think we're in vigorous agreement here," Clinton said at one point. "Let me concur with the Secretary," Sanders said at another. It is also true that differences of opinion and the jabs from candidates and their staffs are part and parcel of presidential contests, even while each side claims the high ground. "There's absolutely nothing negative about each candidate holding each other accountable for their votes and for their statements," Joel Benenson, one of Clinton's senior strategists, told CNN. But at several points during the debate, the candidates went beyond opposing views and engaged in disputes that both campaigns criticized as negative or out of step with the positive tone both had promised to uphold. In last week's New Hampshire debate, Clinton accused Sanders of engaging in "an artful smear campaign" because he was implying that politicians who took money from Wall Street and Super PACs had been bought and paid for, without actually accusing Clinton of being influenced by the financial contributions she'd received. "I think that Secretary Clinton pointed out that, if you want to make an accusation against me and my integrity, do it. He didn't do that. So I think they hide behind a little bit of innuendo," John Podesta, the chair of Clinton's campaign, told CNN on Thursday night. Weaver, Sanders' campaign manager, told CNN that Clinton's jab was disappointing and "really seemed out of place in the debate." The mounting negativity is driven in part by the anxieties of the Clinton campaign. The former Secretary of State, who was long thought to be the Democrats' only viable candidate and presumptive nominee, is on a sprint to nip Sanders' newfound momentum in the bud. The fact that Sanders defeated her so handily in the Granite State has only convinced the Clinton camp that they need to take a more aggressive posture toward him in the weeks and months ahead. But the accusations of attacks, mudslinging and innuendo have made it increasingly hard for the Democratic party to promote the line that its candidates are running a positive, issue-focused contest. When asked about the occasional sharp exchanges between the candidates on stage and their aides and surrogates afterward, Democratic party chairwoman Debbie Wasserman Schultz dismissed the premise of the question as "a media construct." "The use of the term 'low blow' or 'artful smear,' both were applied to the aftermath of a substantive discussion, which the Republicans have not engaged in in any of their debates," she said. "Their debates have been insult-fests, in which they've mostly engaged in personal attacks." Wasserman Schultz conceded that things had got "a little testy," but said that was just "what campaigns do." "You had a very pointed, some would say divisive, campaign in 2008 between Barack Obama and Hillary Clinton, and ultimately Barack Obama was elected president and he asked Hillary Clinton to be his Secretary of State," she pointed out. "It doesn't get more unified than that."